The King of Comedy, Dolphy stars as Mang Pidol the storyteller in Pidol’s Wonderland. This Sunday, Mang Pidol will tell the story of a little girl who is mysteriously transformed because of her lies. 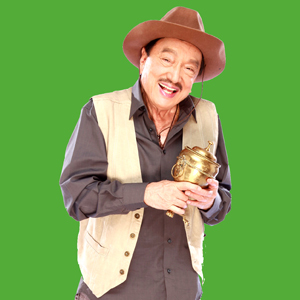 The King of Comedy transports viewers every Sunday afternoon into enchanting realms as TV5 airs the weekly fantasy and comedy series Pidol’s Wonderland, a collection of wonderful stories for the whole family as told by no other than Dolphy himself as the very funny and endearing "Mang Pidol." Pidol’s Wonderland dramatizes, adapts, and retells well-loved folk tales and legends, as well as original tall tales and fantasy stories that are perfect for the kids as well as for the whole family. A curio shop owner in downtown Manila, Mang Pidol brings in the comedy together with his sons Bart (played by Vandolph Quizon) and Panyong (Epi Quizon), his daughter-in-law Jenny (played by Vandolph’s real-life wife Jenny Salimaw-Quizon), and his cute granddaughter, newcomer child actress Baby VJ. The curio shop is where Mang Pidol’s animated storytelling sessions are usually attended by a motley group of common folks in the neigborhood—the barbers Samson (Brod Pete) and Adonis (Long Mejia), the bakery owner Brigit (Joy Viado), and her assistant, Lyla (Arianna Barouk). On its fourth episode this Sunday, April 25, Mang Pidol tells the story of Ningning (played by Sweet Ramos) in the episode entitled "Ningning Sinungaling," with guests Lovely Rivero and Sammy Lagmay as Ningning’s parents. Ningning is a little girl whose illusions of being rich, inspired by her family’s poverty, has led her to become a chronic liar, telling her classmates that she lives in a big mansion and owns a hundred pair of shoes. But Ningning doesn’t know that someone else hears and despises her lies—an old mysterious lady who will put a spell on her that will turn her nose, ears, and chin grow long with every lie she makes. How will Ninging solve her big and long problems? Find out this Sunday, April 25, as Mang Pidol treats his viewers to a weekly dose of humor, light drama, adventure, romance, and fantasy on Pidol’s Wonderland directed by Eric Quizon, airing every 6:30 pm on TV5.